Discussion in 'Civ4Col - Mods and Files' started by orlanth, Jan 7, 2010. 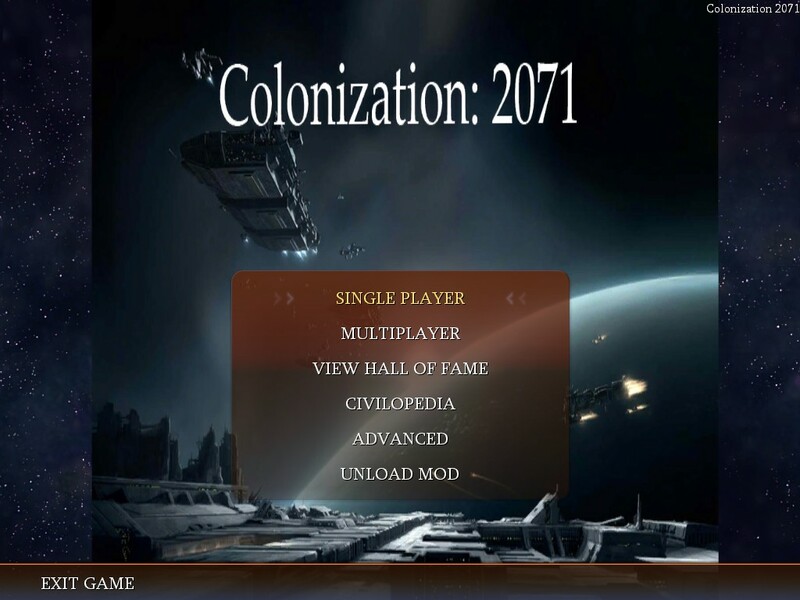 Welcome to Colonization: 2071 , a complete scifi / space colonization remake of Civ4Col. 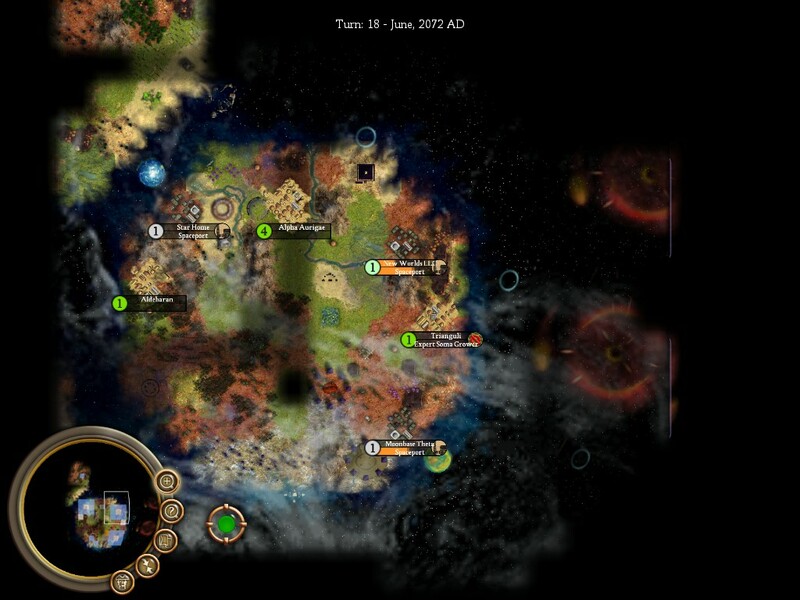 Replacing ocean terrain with Deep Space, New World continents with faraway planets, Caravels with Starships, and native tribes with alien species, this mod aims to recreate the classic gameplay of Colonization in a scifi setting. Similar to their compatriots of 579 years earlier, the colonists of 2071 are setting forth from a repressive and dystopian Earth in search of freedom and opportunity in strange new lands. Arriving on a variety of distant planets, the colonists encounter rare plant and mineral resources instantly in great demand by Earth's dying industry, and uncover a series of ancient ruins left by an advanced and mysterious alien race known as the Progenitors. 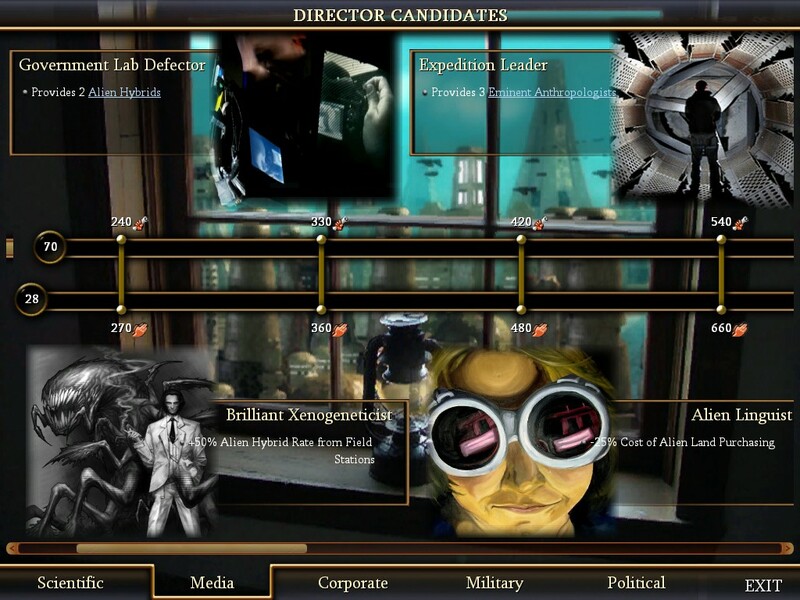 2071 incorporates features from the Tech Tree Modcomp by Kailric, enabling a technology tree that gradually unlocks access to various resources, units, and professions with the progress of research. The natives (alien species) are also enabled as playable civilizations that can interact with Earth. See the Game Concepts entries in Civilopedia for an introduction to the new game features in this mod. If you want to try the gameplay of standard Colonization with a scifi setting, I'm leaving up a link to the 0.02 version which is largely a cosmetic reskin of the original game with few dramatic gameplay changes. All of the graphical imports you'll find in-game are taken or adapted from the excellent work of other mods (mostly Final Frontier and NextWar, also Dune Wars, Planetfall, FfH2, Mars Now, Song of the Moon, Elder Scrolls and more) and contributors on civfanatics forums (especially including saibotlieh, dacubz, clanky4, LordTirian, Deliverator, cfkane, Ekmek, TheCapo, nitram15, Walter Hawkwood, GeoModder, Bernie14, hrochland, C Roland, Zerver, Refar, GarretSidaka, seZereth, and others too numerous to mention, and a wide variety of indie 2D scifi art from deviantart and across the web). The space-age soundtrack includes a variety of samples and remixes from Ektoplasm and many indie ambient/psybient artists including Solar Fields, Carbon Based Lifeforms, Vibrasphere, and Ulrich Schnauss, you can find full album and artist info in the Sounds/Soundtrack mp3 files. If you enjoy the music, please look into buying some songs in their original high quality uncompressed format to support these unique artists. This version also includes a custom mapscript thanks to expert python help from TC01 and Platyping that can generate sets of random circular "planets", as well as the awesome Tech Tree Modcomp by Kailric and Domestic Markets by AndrorctheOrc. Thanks to ongoing interest and the great help of Nightingale and Kailric in developing an improved DLL code base, a new 2.0 version of the mod is being totally redeveloped to enable all-new graphics, new unit/building/tech content, and an improved DLL codebase that avoids previous bugs and slow turntimes. It is in a pre-alpha stage available here; Nightingale made a tutorial on how to download this new version from sourceforge if you are interested. The older (playable) version remains downloadable through the link below. If anyone else wants to help out on the mod (with a view toward creating a solid base for any future scifi modmods) even the most minor or occasional help is greatly appreciated. I am posting a list of the basic next steps for getting some of our set of scifi graphics into the mod and tested (will also copy this to the top post on this thread). Actually the most basic and important step would be to download the 2071 mod branch and the new current DLL from sourceforge and test their current stability together. With there being so many ongoing changes to the M:C DLL and gamefonts, having been away I'm not sure of whether the 2071 on github is currently still working seamlessly with these or may need some debugging to stay compatible. To do this, first install Smartgit and download and install the current 2071 version from sourceforge using Nightingales tutorial (also other tutorial links at the top of this thread): http://forums.civfanatics.com/showthread.php?t=349050&page=29. Then you can get the new (pre-alpha) version of the mod running on your pc (make sure to also download the DLL file from this thread http://forums.civfanatics.com/showthread.php?t=529266) Once it's running and stable you'll also be able to start trying out making changes to the graphics and XML. An easy approach would be to take some of the existing buttons and resize these to the appropriate gamefont format (using GIMP/Photoshop or other software) and perhaps do some minor artistic touch-up to get them to show up nicely in-game. I have made buttons for all of the Yields (in Assets/Art/Buttons/Yields on sourceforge) and also a huge selection of scifi-themed buttons (see 2071 Buttons Pack in my sig) from which you could select whichever ones you like to convert to icons. I've so far lacked the graphical flair to be able to convert these well to gamefonts but think anyone with some graphical interests could be able to do this nicely. (One general comment about Gamefonts icons: one potential problem with mods like RaR/M:C/new 2071 with lots of new Yields is that the many new tiny gamefonts icons can be hard for new players to always easily visually identify what they mean. (ie you see a wide variety of new little icons in many places and as a new player may have no idea initially whether they mean Leather Armor, Furniture, Dye, or what have you). I'm not sure how to best deal with this, but maybe planning a general system with some degree of color-coding could make things easier and more intuitive for players. Ie perhaps the advanced "processed" Yields produced in towns could have some distinguishing feature such as a gold border, while raw Yields harvested on the map could have no border. In 2071, taking a look at the design document showing the Yields; there are several categories that go naturally together. For example: Actinides, Isotopes, and Rare Earths are geologic yields produced by the Expert Geologist; while Nucleic Acids, Amino Acids, and Tissue Samples are biologic yields produced by the Expert Lab Technician. If these categories could have some distinguishing feature (such as a blue interior border, or overall blue tint, etc) they could become easier & more intuitive for new players to identify. Anyway, just an attempt to get a discussion going but I'm thinking some system of color-coding could be useful here. Also I think it could help all mods in general if more of the tooltips showed the name of the Yield as well as its icon). Lastly I have also uploaded recently for PatriotNorwood a megapack of scifi nif graphics for Units, Buildings, Improvements, etc I've collected over the years. This contains lots of NIF graphics which hopefully should be fairly easy for even novice XML modders to start getting into the game and testing out. You can browse through some of these using Nifskope; let me know how you like them, there's so many they won't all get used in the mod but there is some great stuff in there including lots that can be reused for a Star Wars modcomp once they're in the game. As far as buttons, I recently cranked out a huge set of scifi buttons & uploaded them to the link in my sig. Since there are over 2000 buttons with a lot of diversity I'm hoping this will provide quite a big resource for SF modders to work with. 1) Browsing through the collected graphics to identify what you think is the most appropriate graphic to fit each unit/building etc. 2) Adjusting folder names for those graphics to match what the Artdef XML looks for. 3) Test them out in game to verify that new graphics are loading appropriately without crashes/glitches. 4) If you notice problems, you can use some minor graphical and XML troubleshooting to work out any kinks in how the graphics are loading/appearing in-game. For example, if graphics appear at the wrong scale they can be resized by adjusting the scale in the XML Artdefs file. * With Deliverator's tutorial you can often use nifskope to easily resolve many glitches in imported units. * I've been told that in many cases if there are issues loading graphics in game, sometimes simply importing into Blender and re-exporting can easily resolve this, though I've as yet had a hard time getting it to do this correctly on my pc. If you're able to install Blender this may help greatly in getting scifi graphics working in-game. * Lastly, when importing graphics from other mods or Civ4Bts, remember they're often looking to load DDS textures from that mod's /Art/Shared directory; so the number one easy solution for many problems can be to make sure shared art isn't missing. For 2071 and other scifi mods, perhaps the best thing is to make an /Art/Shared directory that contains everything from the /Art/Shared folders of scifi mods like Final Frontier and Dune Wars, this will minimize these kinds of problems. If anyone is able to help out with graphical and XML stuff like that it would be awesome, and hopefully should make fairly quick progress in getting good scifi graphics into the game, which can then be easily used in any scifi themed mod. I've made a Google Docs for the design document below that anyone can view. It's probably best to start thinking through design decisions, features, and balancing so would welcome any comments / suggestions / input from modders & anyone who's played the mod! Happy modding to everyone.. may the force be with you, live long and prosper and the truth is out there! * blast off and colonize some New Worlds! The year is 2071. As constant unrest seethes beneath an unchanging balance of power among the elites, the superpowers of China, NAFTA, Russia, and the European Union have reached an uneasy stalemate on a deteriorating Earth. The world seems suspended between chaos and stagnation - until unexpectedly, a half-forgotten collaborative project between a team of international scientists detects evidence of a dormant wormhole-like anomaly lying hidden between Venus and Mercury. An exploratory craft is soon able to enter the wormhole; the spirit of cooperation quickly gives way to nationalist infighting among the project's sponsors as it becomes clear what has been revealed. The wormhole enables access to a handful of distant worlds; each Earthlike enough for human habitation, but home to exotic plant and mineral resources that could prove a boon to Earth's dying industry. Humanity is no longer alone - the worlds are sparsely inhabited by a handful of primitive sentient alien species with bizarre language and customs but vaguely humanoid features. Further exploration discovers ruins left by an incredibly advanced ancient race known as the Progenitors, whose lost technology constructed the wormhole as a means of transport, and who some believe created each of the races on the worlds it links - perhaps even Humanity itself. Create a thriving colony among the planets of the New Worlds. Life on the stellar frontier is difficult; you begin with access to a limited selection of Colonists and resources and must research technologies to advance. Revolution Victory: Declare your independence from Earth after attaining a 50%% Rebel Sentiment in all your colonies. Before time runs out, defend your fledgling nation from the wrath of your home planet by wiping out all their ground forces. You must complete your revolution before any other Earth Colony or Alien Empire. The corrupt superpowers of Earth are slowly crumbling; the Expeditionary Force starts powerful but grows slowly with time, making Independence an achievable goal. Hegemony Victory: Ensure the absolute hegemony of your nation over these New Worlds. Suppress the alien natives and subjugate or destroy the other colonies of Earth. Your colonies must dominate the New Worlds before any other human or alien power reaches independence. The alien races (natives) are now enabled as playable civilizations. They begin with several existing settlements via Advanced Start, and maintain an advantage in harvesting native resources, but are much slower than humans at creating advanced infrastructure and manufactured goods. They start with access to alien techs but are unable to research the advanced human technologies. For full rules and strategy about playing an alien species, consult Alien Civilizations under the Game Concepts section in the Civilopedia. From across the Great Sea they came, in their ships of fiery metal. It is told that others of our race once journeyed to their star, watched them in secret from our sleek saucers. But now it is we who are watched. Lost on these forgotten planets, we have grown weak and backward, the secrets of the ancients lost to us. Sleeping among the sweet fungus, our people heed not the words of their elders as the Earthlings settle on our home, perhaps to drain it as they drained their own. What will it portend, the arrival of these thin-skinned creatures? Place the settlements of your race. Living in a state of pastoral anarchy, your people must build a Ziggurat in each of your settlements to enable further development and trade. Hegemony Victory: Ensure the survival and dominance of your species. Expel the Earthling invaders and subjugate or destroy other alien races. 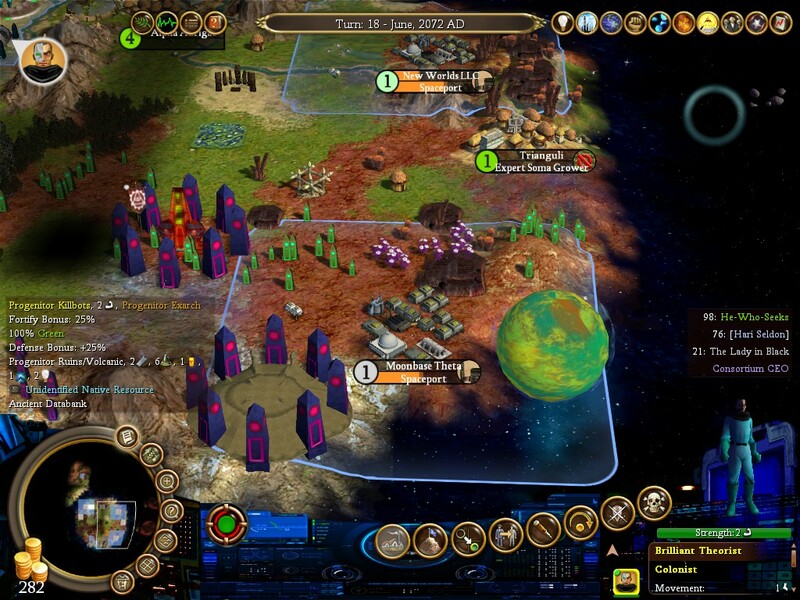 Your Empire must dominate the New Worlds before any other human or alien power reaches independence. Revolution Victory: Declare your independence from the Progenitor overlords after attaining a 50%% Rebel Sentiment in all your settlements. Before time runs out, defend your fledgling species from the Progenitors' wrath by wiping out all their ground forces. You must complete your revolution before any other Earth Colony or Alien Empire. Living in a state of pastoral anarchy until the arrival of the humans, the aliens must construct a Ziggurat in each settlement to enable further organized development, effectively giving human players a 50-turn head start. The Ziggurat also functions as a basic market building to represent the aliens' internal economy; enabling each settlement to automatically sell excess resources at a small fraction of the price on Earth. This ratio can be increased by constructing buildings such as the Landing Pad to enable offworld trade with independent smugglers. After gathering sufficient industrial goods and building a Shipyard, the aliens may construct a variety of space vessels such as the Saucer and UFO, and can eventually discover and enter the wormhole to Earth. Due to the monopolistic practices of the Earth superpowers, aliens can only conduct covert trade with disenfranchised Third World nations, and the market prices they receive will be much more volatile than human colonies. Nevertheless, smuggling goods to the black markets of Earth can prove a vital lifeline for alien civilizations in need of currency and manufactured goods. 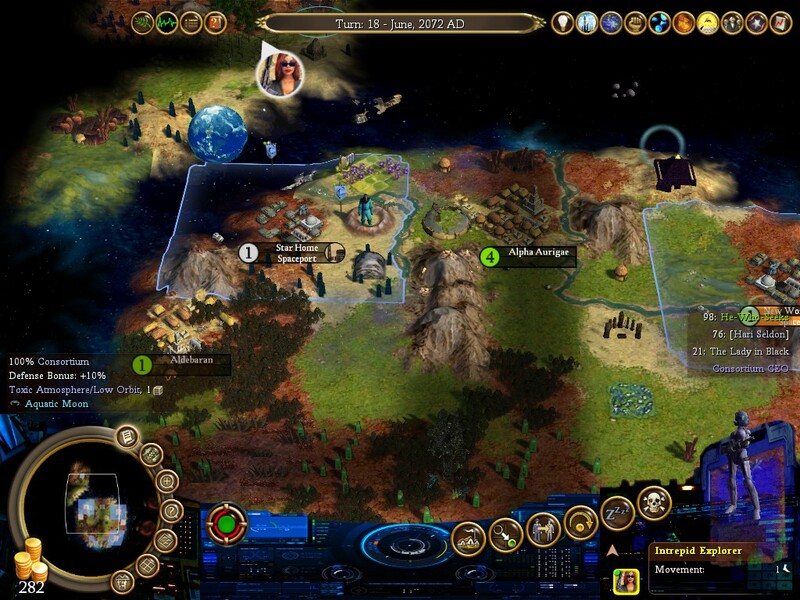 On dystopian 21st-century Earth, the political situation in some Third World nations has become so intolerable that some aliens are able to lure a limited trickle of human colonists to their worlds, by building an Earthling Habitat in their cities to generate Propaganda, or having an alien Elder work on a tile with an Abduction Site. Although aliens again have a severe disadvantage in attracting emigrants compared to the human colonies, the manufacturing skills of even unspecialized human colonists make them greatly prized among the species of the New Worlds. Abducting human colonists by force is another alternative to gain access to their vital skills - when conquering a human colony, aliens will create a Human Hybrid who will also work in manufacturing facilities much more efficiently than the aliens themselves. Accustomed to unquestioning obedience to the tyranny of the long-absent Progenitors, the arrival of the Earthlings stimulated many alien elders to return to the ways of their ancient mystery traditions in search of enlightenment and power. Long dismissed as the rantings of conspiracy theorists, secret societies such as the Illuminati have covertly permeated alien and human societies for centuries, and have many secret adherents among certain select members of the Earth elite. Through deep connections to this far-reaching conspiracy, the alien elders of an Illuminati Lodge could begin to challenge the dominance of the Progenitors, and occasionally even attract highly-placed human conspirators to join with their agenda. * All the low-level resource processing buildings (Biotech Lab, etc) are no longer automatically present in every colony, and will need to be constructed. The Earth Colonies start with a free processing building depending on their nationality. * The Expeditionary Force starts the game larger, but grows much less rapidly with Liberty production, making independence through Liberty a more achievable aim. With the worldwide deterioration of democracy, real power on Earth is concentrated in the hands of a small cadre of military, corporate, scientific, media, and political elites. Attracting one of these men and women to your side could prove a crucial advantage in the struggle for the New Worlds. Want to produce more Biotech from each unit of Xenospores? Then you'd better be the first Earth power to recruit the services of the Biotech Tycoon. Want to generate more Propaganda (Crosses) for each point your Tax Rate is raised? Then the Notorious Tax Evader is your man! * New human buildings: Mass Driver (fortification that protects against damage from bombardment), Space Elevator (allows for automatic sale of goods without the hassle of transport). 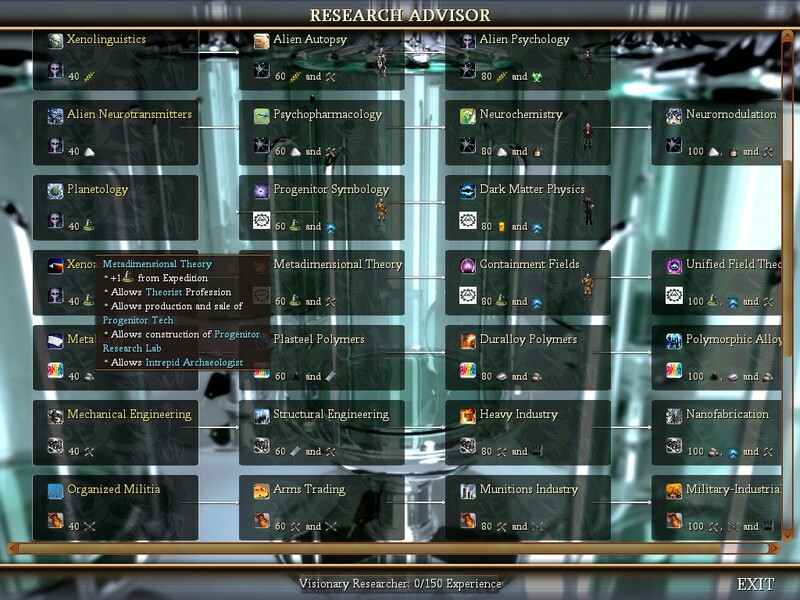 The latest version incorporates features from the Tech Tree Modcomp by Kailric, enabling a technology tree that gradually unlocks access to various resources, units, and professions with the progress of research. Research is done by selecting a Tech from the Tech Tree (light bulb icon on the top of the main screen) or by opening a menu light bulb on the bottom right of the city screen, then having colonists work in the Research Labs in your colonies. Producing each unit of Research will consume one unit each of various other goods, with the type of goods consumed depending on the specific tech being researched. 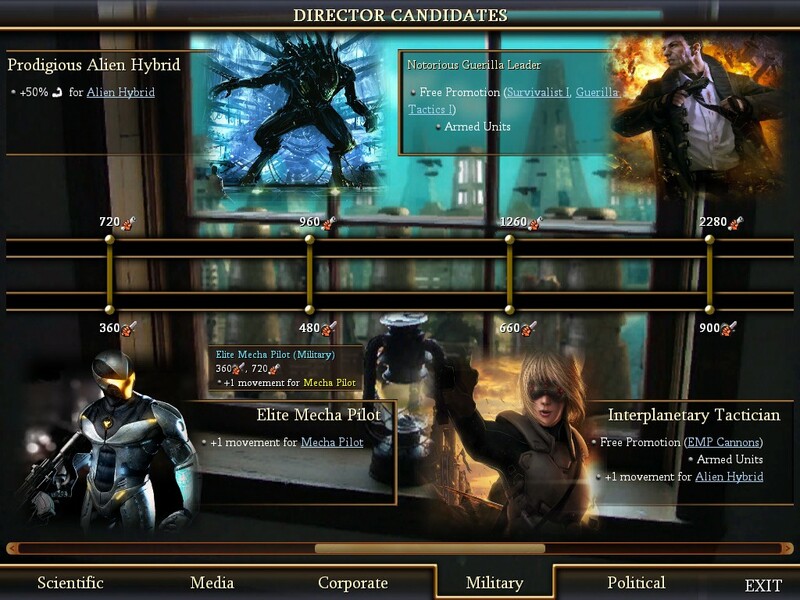 See the Technologies entry under Game Concepts in the Civilopedia for full details. Survival on the harsh frontiers of outer space is far more challenging than regular Colonization. You will start with very few resources, colonists, and profession types available, and must invest in research to unlock new possibilities. To discover the technologies needed to harvest alien resources like Soma, Xenospores, and Progenitor Tech, trade for samples of these precious materials in alien settlements, then ship them to your Research Labs for analysis. With supplies of Weapons jealously guarded by the Earth superpowers, most military units are not available early on, leaving colonies vulnerable to alien attack. In planning your technological research, balance the needs for a powerful military and a strong colonial economy. If you are friendly with another human colony or alien empire, trading technologies through the diplomacy menu can be an effective way to gain a scientific advantage. Civilizations can also enter into a Research Pact where all progress on that technology made by both participants will be pooled. Performing research in your colonies can gradually attract a Visionary Researcher from Earth, a special type of Great Person with superior Research output. Constructing a Databank, or upgrading the basic Research Lab to a Research Institute or Research Complex, will also significantly boost scientific output. The unique sites found in a Progenitor Metropolis can hold a wealth of valuable goods and treasure, but are often guarded by centuries-old security systems. With the proper technology, capturing a unique site such as a Progenitor Reactor can allow direct extraction of Fusion Cores and other advanced goods without the need for time-consuming manufacture from raw materials. There is an occasional bug in version 1.0 where Research Labs don't show up in any of your colonies from the start. On starting a new game, check your first city to see if it contains a Research Lab. If it does not, just start a new game and the bug should go away. Research Labs: Note that there is an occasional bug where Research Labs will not be available in your colonies after starting a game. We havent yet been able to track down the cause; but for now as a basic workaround, if your first colony starts without a Research Lab, start a new game. If your first colony does contain a Research Lab, you should be fine for the rest of the game. and have the mapscript use that when making terrain types; that would create polar ice caps and equatorial regions on every planet. Would also like to find how to make a python check for inland "fresh water lakes" and for the "sail to Europe" space terrain, since I'd like to put some special improvements over those terrain types. I've been thinking of making the Alien races more powerful/aggressive, somehow improving their AI to act more like the human colonies, occasionally abducting earthling Colonists, and placing Crop Circles over colonial improvements. Not sure how to accomplish this though. The China of the late 21st century is similar to today's China, but with an older and larger population (1,8 billion since the Legitimate Children Registration Act), Mongolia, North Korea, Taiwan, Nepal, and nearly all of Southeast Asia have been annexed or made into puppet states. Similarly to Europe and Russia, China has problems with its large Muslim population and represses it mercilessly, along with its numerous other ethnic and religious minorities. Although China is arguably the world's preeminent military and economic power; the century-long stranglehold of the Communist Party over its vast population is looking ever more tenous, as a tide of silent unrest seethes beneath the surface. Due to its massive population, tightly-controlled media and repression of dissent, Chinese colonies require less Propaganda (Crosses) to generate each new Earth emigrant. Since the aftermath of the Soviet Union's collapse, Russia has gotten a bit worse politically and better economically, but is actually slightly more democratic than North America. The power of the central government was seriously undermined by the second great economic collapse, and Russia has been periodically seized by corruption on a scale not seen since the 1990s. Ironically, the pervasive influence wielded by its cadre of billionaire corporate oligarchs has made Russia one of the last bastions of unrestrained free-market capitalism. The economy is vast, fairly prosperous, and diversified, although marked by deep divisions between rich and poor. The populace is nationalist and very anti-Chinese and anti-US. Belarus, Its current President is a strong proponent of realpolitik. Eastern Ukraine, Armenia, Serbia and Abkhazia are part of the Russian Federation. Bulgaria, Estonia, and much of Central Asia are once again puppet states beholden to the industrial titans of Saint Petersburg. Thanks to the pervasive economic influence of its cash-flush multinationals and organized crime, Russian colonies enjoy a more robust market for exported goods. In the United States, the office of President has been continuing its growth much as it had in the 20th century. Megacorporations now openly sponsor and endorse candidates, and some even have contracts with their employees regarding who they have to vote for. A nuclear terrorist attack destroyed Boston in 2055, after that a nuclear war with the Saudi coalition almost ensued. Civil liberties are severely eroded. Although nominally sovereign powers, the nations of the North American Free Trade Agreement (now including most of Central America as well as Canada, Mexico, and Capitalist Cuba) have become increasingly indistinguishable and interdependent, relying on a constant flow of remittances and cheap labor between their borders. In spite of a faltering economy and widespread unrest at home, NAFTA military spending continues apace, with an ever-increasing flow of resources drained into propping up its client governments in Afghanistan, Iraq, and Venezuela. The NAFTA colonies begin with a Veteran Soldier, and have an advantage in combat against the natives of the New Worlds. Late 21st century Europe is varied; some countries have semi-functional social democracies, others are corporate republics, while others have practical oligarchies or even in the case of Britain are ruled by a very despotic regency council (the royal families have been mostly killed off by bioterrorism). Norway, Iceland, Switzerland, Western Ukraine and all of the Balkans except Serbia have become EU members. Citizens have many rights in theory, but in practice the nanny state of the EU has become a prison; a comfortable prison but a prison never the less. Democracy on the level of the union is in theory the best in the world since the constitution was adopted in 2017, but in practice Brussels is fast becoming the next Washington. The ESA has become an EU agency. Certain sciences remain well funded by the federal apparatus, and Zurich is a world center of neuroscience and genetics. Perhaps because of this scientific advantage, and perhaps due to the environmental rhetoric and measured diplomacy of the plodding central bureaucracy, European colonies enjoy an advantage in dealing with the native species of the New Worlds. For the wealthier nations of Earth, the development of nuclear fusion was a partial answer to the dual problems presented by the peak oil crisis and worsening global warming. However, the technology is not as efficient as had been hoped, and requires a steady input of radioactive metals, which are now becoming depleted from Earth's crust. Upon the discovery of the New Worlds, a new gold rush of Uranium Miners journeyed forth in search of fresh deposits of radioactive fuel. They were soon joined by a cadre of enterprising Physicists, hoping to break Earth's monopoly on the refining of raw Uranium into functioning Fusion Cores. While believed to be native to a faraway star, the narcotic plant dubbed Soma has found a welcome home in the sweltering heat and heavy rains of portions of the New Worlds. Pleasantly addictive yet with fewer long-term ill effects than the synthetic drugs of Earth, hundreds of Soma plantations sprung up in the Chinese, Russian, and NAFTA colonies, turning the long roots into an invaluable industry. A professional Drug Runner has an almost magical ability to turn a ton of raw soma, worth a pittance after shipping costs, into pallets of refined Narcotics, which are not only more valuable and addictive than the soma they came from, but also much lighter and thus cheaper to ship. A top-quality refinery could easily increase the profitability of a soma plantation exponentially. The alien spores of the New Worlds are a surprisingly challenging crop to master. Spores can be found naturally throughout the worlds, but their thick threads can be so filled with toxic mycelia as to be completely unusable. Many biotechnologists wrote the fungus off as too difficult to earn a profit from. Yet in the hands of a skilled Spore Grower, even these great challenges could be surmounted. Selective breeding could make the fibers more workable and use of inventions like the Bioreactor suddenly made this botanical nuisance the most popular - and profitable - fiber in the pharmaceutical industry. Raw Xenospore extract is turned into potent Biotech pharmaceuticals with the ability to extend human life for decades. This is a slow, arduous and difficult task at best, but in the hands of a skilled Biochemist, such transformations can be quick, industrious and artful, creating a product far superior to anything a mere amateur could create. The ancient ruins dispersed across the New Worlds held a wealth of ancient Progenitor Artifacts, whose analysis required a bewildering array of skills, from higher mathematics to nanoparticle engineering to molecular xenobiology. If eventually adapted into usable Progenitor Technology, the Artifact became worth many times its inital value. With the universities of Earth under close government control, few colonists of the New Worlds could ever hope to muster the vast knowledge, resources, and containment facilities necessary to reconstruct shattered centuries-old alien technology. Nevertheless, a select few Visionary Researchers managed to escape the clutches of Earthside governments and traveled to the New Worlds to unlock the secrets of the Progenitors for themselves. Although of little use by themselves, consuming Hydrocarbons in a Power Plant or Oil Refinery can greatly increase a colony's industrial output, especially if there is a shortage of Plasteel. The Power Plant generates no production on its own, but laborers burning Hydrocarbons in the Power Plant add a significant percentage bonus to all Industry (hammers) and manufactured goods being generated in that colony. The alien races (natives) are now enabled as playable civilizations. They begin with several existing settlements via Advanced Start, and maintain an advantage in harvesting native resources, but are much slower than humans at creating advanced infrastructure and manufactured goods. They start with access to alien techs but are unable to research the advanced human technologies. There is an occasional bug in version 1.0 where Research Labs don't show up in any of your colonies from the start. If you encounter this, just start a new game and it should go away. Although you can play this mod using the standard New World and Carribean mapscripts that come with Civ4Col, the resulting continental landmasses won't look very planet-like..
Just a few weeks ago I thought about attempting something like this, probably using Final Frontier's backstory as the base (since in the Final Frontier mod Earth practices really strict mercantilism with all it's colonies). I never did any work on it though. As a start with mapscripts, you could use the Donut script from Civ IV and adapt it to generate different terrain types other than grassland. It only creates one "Donut"/planet though, but at least it's circular. Your mod has already more background story than my own ... .
And you should think of adding India as a civ. Their space program is not much behind the chinese one. 1)Lots of miscellaneous graphics (especially buttons!) to be done. Also replace the large ship icons (Europe screen) with appropriate space vessels. Simple buttons you can easily do yourself, they are not complicated . 3)Futuristic City Buildings: Though most of the actual Buildings (Bioreactor etc) look relatively ok, I kept getting crashes when trying to replace generic houses in CityPlotSystem with more futuristic citysets (eg the ones from Planetfall). Do they work, when you try to add them as normal building in the game? Can you not just use the Final Frontier terrain? 5)Units: Graphics for Armed Alien, Alien Vessel and others. Some of the colonist professions still use the old graphics. Maybe eventually develop different Alien units by species? I thought, that the orc units from FfH2 or Warhammer would work good as basic aliens. Progenitor Ruins don't overlap well. I changed their fScale to 0.45 in the art files to make it less glaring, but that makes them much smaller than they were. The Nebula is missing it's button (it appears as a pink square). It points to a path in the art files that doesn't exist. but the donut/planet in the top left corner isn't being created and I don't know why. Anyway, it's optimized for the larger-sized maps. Wow thanks a lot TC01 - having any kind of spherical planets mapscript would be awesome! Once the basic planet shapes are there, it should probably eventually be possible to have each planet "donut" get a unique mix of terrains/features/resources depending upon climate type (Volcanic, Barren, Marsh, etc). Yeah the current single-tile Ruins graphic is far from ideal. I really want to adapt something like the Caretakers cityset from Planetfall, but having a hard time figuring out how to do that since the cityset is one big nif file with multiple nodes floating in space for each building. I've made progress though on better Space Terrain (edit: though Low Orbit looks better, still having problems with Deep Space ), also fixed the Nebula button, replaced Tobacco leaf with Uranium drum in GameFonts, & making some various other textual and graphics updates. So hopefully should have an updated version before too long - TC01 please post your donut planet mapscript if you have it & I'd love to include that in the next version. Here you go then. I renamed it "Planets". All four planets are roughly the same size and appear in roughly the same position each time. I tried to push ice and tundra up a little bit so that the planets have some snow and tundra on them. As I mentioned, it works best on larger mapsizes. Great mod! After I finish with the Scandinavian LHs I would be happy to make a few Alien LHs for you. (Along with a few alien units for different cultures). I was thinking of a terrian feature like a Pulsar that you might be able to put in Deep Space. Have started putting together an updated version now, replaced old Ruins tile with Planetfall monlolith graphics among other things. I think that Planets mapscript is making a big difference in how fun it is to play. Thanks charle88, it would be great to have some more alien leaders and especially units! I've added a few from the civfanatics forum for the next version, non-human scifi leaders/units seem to be pretty rare though. I wonder if I could adapt your Emperor Palpatine LH as an alien, with some minor modifications he could fit pretty well. BTW does anyone have any recommendations re the best site to put the next upload, and where else I should post this to give broader visibility for ppl looking for Civ4Col mods? It seems like a lot of people are having trouble downloading it from filefront.com. WePlayCiv has no file size limit, unlike CFC, so I host WestwardHo there. (because of this, you don't need to have absolutely every function from the feature generator, like def addFeatures or def getLatitudeAtPlot, unless you're changing what they normally do). This is a mod what I thought of for a long time. Add more graphical elements to make it seen like in space. Change resource and product types to match the future background. For instance, we go to outer space to look for Uranium, Valuable Metals, Iron, and Solar plant locations. Or even alienate creatures and liquids. Food and life supports should be transferred from the earth, until some accomodation buildings are built. Now updated to version 0.02 (new link in first post) - enjoy it and let me know any comments! This is a new install rather than a patch; it includes a variety of updates to graphics, leaderheads, audio, and text, also packaged with TC01's Planets mapscript for much improved interplanetary random games. City graphics: could use help with LSystem issues importing a futuristic cityset and getting Arcology dome from NextWar over the cities to replace Fort/Fortress. Hey thanks charle88, that looks great so far! Here's a unit for a Flying Saucer which I tried to adapt from the Cloudbase in Planetfall - still looks partly transparent though, I'm not sure how to get it to be fully opaque and maybe hover further above the terrain. What I'd eventually like for this mod is to make the Aliens more powerful and versatile than the basic Col natives, so that you could even choose to play as one of the Alien civs. Though starting out weak and only able to harvest basic goods, they could become able to abduct skilled Colonists from nearby human bases and gradually build their own economy to resist the Earth invasion. I finally got the Planets mapscript to include several of the new terrain features (Fungal Forest, Cycad Forest, etc) - I did it by copying the standard MapGenerator functions directly into the script, so now any of these can be directly modified if needed. If you could store that value for each plot, and redefine the function getLatitudeAtPlot to retrieve that value, then it would automatically make polar and equatorial zones for each planet being generated! It might be, but not without a lot of work. Because planets are generated in the plot generator, not the terrain generator, the center of a planet and the radius of a planet would need to be passed to some kind of global array, especially since I made the radius and center coordinates not constant- they shift slightly. This array would need to be accessed by the terrain generator, and that would need to be rewritten to make it work. I would elaborate more on how to rewrite the terrain generator but I have no clue how it would be done.